Home » Website Building » How to Setup bbPress Forum in WordPress? WordPress is a powerful content management system for content sites and blogs. However, when it comes to building your community, there are many other powerful platforms available. The best options are phpBB, Simple Machines Forum, MyBB, vBulletin and similar type of PHP based forums. These packages offer exhaustive options for managing your forum. You also have other managed forums like XenForo, Discourse, etc. Related: Compare phpBB and bbPress forums. But the problem is they are meant for big forums and you need dedicated time to build the community for many years. Also, when you already have an established WordPress site, it does not make sense to start building a community from scratch. The best option to build a forum to your existing WordPress site is to look for forums plugins. There are few good options like bbPress, wpForo and Asgaros forum plugins. Earlier, we have written a review of wpForo forum plugin. You can check out the review to have an idea of the features and capabilities of the plugin. Asgaros is exactly similar to wpForo with less functionality. Though bbPress has fewer features than wpForo and other plugins, the community develops it. The developers include Matt Mullenweg who is behind the development of WordPress itself. So bbPress is a reliable option to start your long-term forum journey. In earlier days, bbPress was separate software and later it is being part of free WordPress plugin repository. There are around 300K people uses bbPress mainly for supporting purposes including the WordPress.org support forum. There are many add-on plugins to enhance the functionality to customize your forum. Below is a sample forum created with bbPress plugin. In our opinion, you should not expect instant support when trying to start a forum with bbPress. It works in most of the cases, however it is a free plugin. You need to have a correct expectation before start using a free plugin. When you are decided to go with bbPress, go to your WordPress admin dashboard. Navigate to “Plugins > Add New” and search for “bbpress”. Install and activate the plugin to start the forum setup. 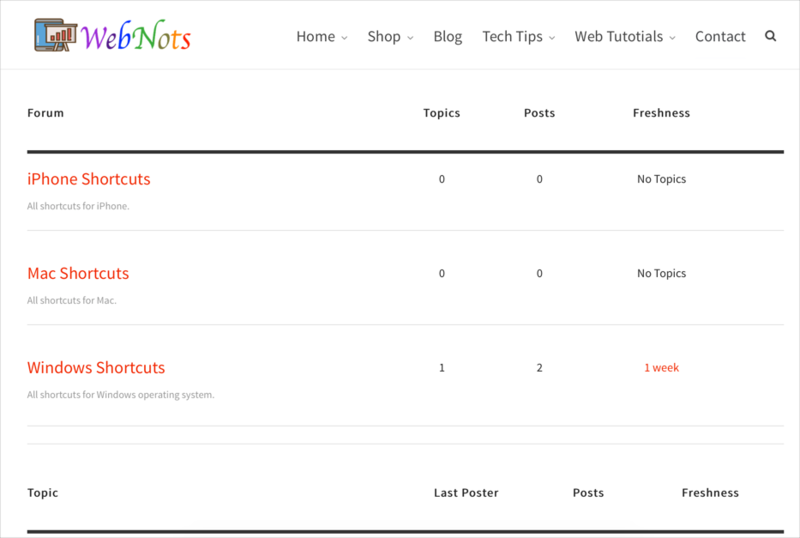 After installation, bbPress forum plugin will create three custom posts types. This is a standard structure similar to any other forum software. 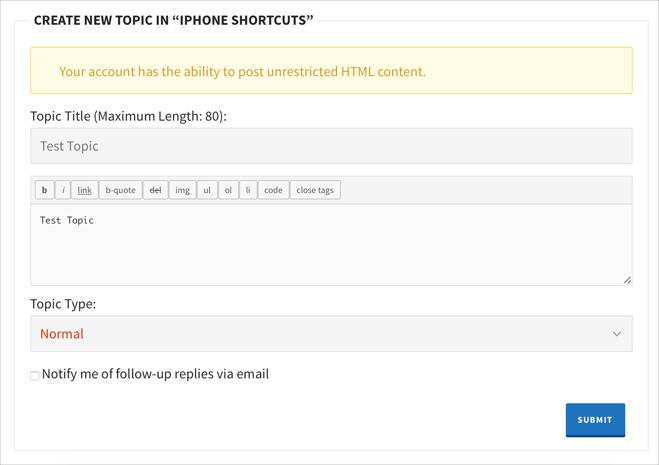 You can create topics and reply directly from your admin panel. unlike other forum software, bbPress plugin will create few user roles. Moderator – you can assign this role of you have a separate people to moderate your forum postings. Probably you need this role when your forum is growing in size. Participant – this should be the default role for newly registered user to have the capability to create topics and replies. Spectator – this is dummy role and users can’t post content. Blocked – you can block any malicious users by assigning this role. Remember, bbPress will use the default WordPress login page for registration. If you don’t want users to access the login page then think of using plugins like WooCommerce or other membership plugins. These plugins will change the login page and not allow users to view the backend dashboard. The biggest advantage of bbPress is that it is a lightweight plugin. It is integrated with WordPress settings, so you don’t need to customize many pages to run your forum. Go to “Settings > Forum” to find the minimal options for your bbPress forum. The settings page contains many options in the following categories, very easy to understand. Forum user settings – here you can throttle the user action on your forum to avoid spam submissions. Also ensure to select “Participant” role for the registered users. We strongly recommend disabling the guest posting to protect your site from spam. Forum features – here you can enable favorites, subscriptions, tags, search box, revision logging, HTML formatting, thread replying and media embed. 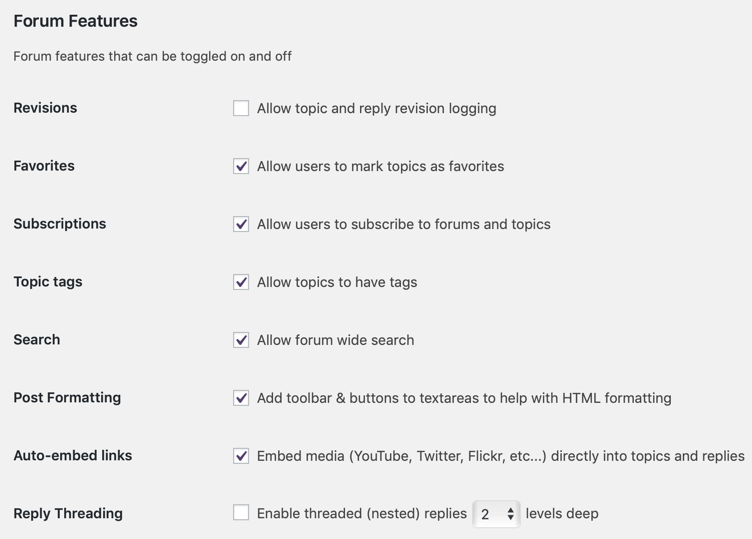 Basically you can enable all the options and disable threading and revisions to keep the forum clean. 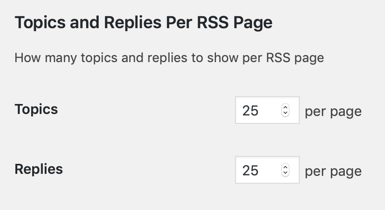 Topics and Replies Per RSS Page – setup the number of posts to be shown in the topics and replies RSS feed. Slug setup – the slug setup is something like a permalink setup for WordPress posts. 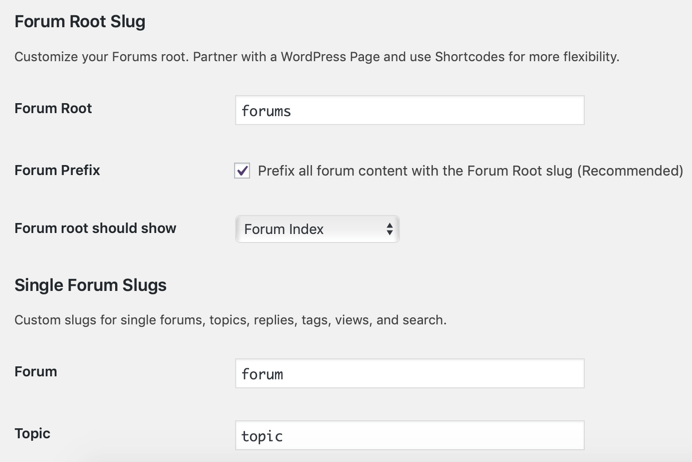 You can leave the settings, as it is to keep them default for single forum slugs and forum user slugs. Two important settings are the forum root and prefix. Ensure to have a correct slugs setup here, changing the setup at later point of time will lead to change of all forum URLs on your site. You can choose to show forum index or topics on the home page of your forum. Recommended: Get special SiteGround hosting offer for WordPress forum websites. You will see additional options in the last section, if you have Akismet or other plugins like BuddyPress. You can customize to integrate the forum with those plugins to work them together. In addition, you need enable user registration and avatars in the settings. After setting up the base configurations, next step is to create your forums. Before that ensure to have an idea of how many forums you need and how to group the forums in different categories. Go to “Forums” menu and create “New Forum”. You can see bbPress continue to use the old classic post editor. So you may need to use Gutenberg for your posts and pages, while continue with classic editor for your forum editing. 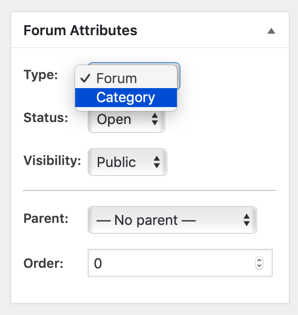 The forum editor will have a “Forum Attributes” metabox. You can choose the type as category or forum depending on your need. Keep the status as “Open” to allow users to create topics under the forum. Recommended: Get Bluehost hosting deal for WordPress sites. Basically you need to create a topic and respond to a topic from the frontend published site. However, bbPress also allows you to create topics/replies from the admin panel. Go to “Topics > New Topic” to start a new topic. You can create the post similar to normal WordPress posts and publish it online. The topics editor will have a “Topic Attributes” metabox from which you can select the topic as sticky, open or closed. Reply editor will have a “Reply Attributes” metabox to choose the forum and topic for your reply. As you can see setting up bbPress needs less than five minutes and your ready with your forum. However, this is a minimal forum and you need to install many other free or premium plugins for enhancing forum features. For example, you can purchase bbPress forum themes like Disputo from themeforest to have a packaged solution for your site. Hi there, thanks for this article. I have a few questions. Can I any cache plugin with bbPress? Can I use bbPress with Multisite Network? Which WordPress cloud hosting provider do you suggest? I have currently Cloudways in my mind.